compliment, transform and define a space. pieces that are part of the interior. 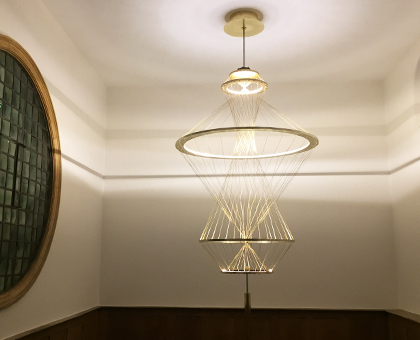 We created a unique piece for the stairwell of this Arts and Crafts Voysey house in Chelsea. The clients brief was for a an interpretation using a modern material palette to dovetail into the space.Constructed from four brass rings holding itself in balance and internally illuminated. 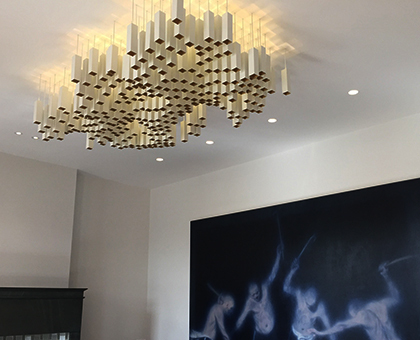 This light feature was created to float over the stair of this magical wine shop, with 250 wine glass light pendants at varying heights. 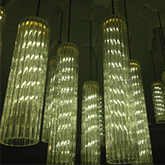 Each glass head has an internal light point within its machined aluminium body to refract light to rims. 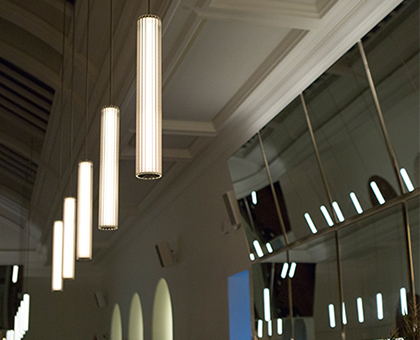 Our Fresnel pendant was adapted for this award winning space at London's Victoria and Albert Museum. 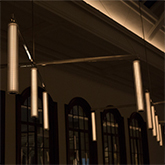 Hung on thin stainless suspensions we incorporated warm dim light sources and custom light frames to allow pendants to hang over dining areas. 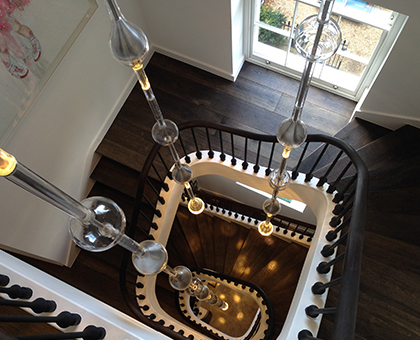 We wanted to create a light feature for this five story townhouse that you passed through as well as around as you ascended the stairs. 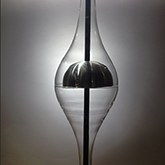 Golden light globes within glass skins slide down their steel threads and finish with a pool of light projected to the floor. Reflecting the river opposite the house and referencing small gold tiles of the fireplace this light feature sits beautifully into the space. 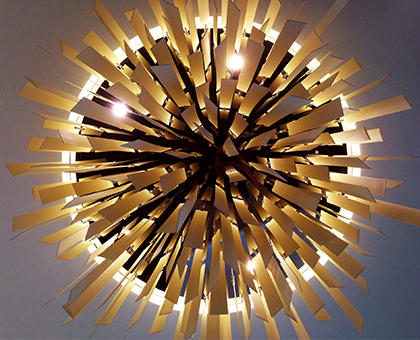 The curves and ripples of the shape are enhanced by the soft light patterns projected to the ceiling and the warm brass tones seen below. For the bathroom the designers asked for a warm soft light in the room which we created with this natural porcelain feature. Blades cascade through an opening to the ceiling which is filled with light, showing the porcelains warmth and lighting the room. For this period entrance hall with already exquisite detailing we wanted to introduce as little as possible and ideally just glass and light. 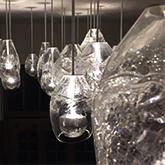 Through experimentation with glass blowing and a small light source we created a sea of glass forms flowing through the space. 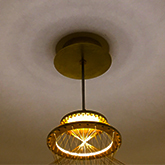 For the Living room of this Georgian home we wanted to create a chandelier that became part of the plaster ceiling rose where the original had been lost. 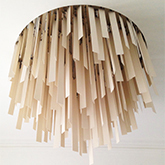 Traditionally moulded plaster tree roots, partly worn suspend twisted glass lights to form this chandelier.